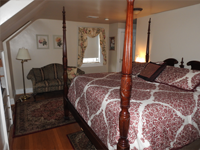 Secluded deluxe room located on the third floor of our bed and breakfast in Williamsburg. Room includes poster king size bed, extra large whirlpool tub, separate large walk-in shower with multi spray shower, cotton linens and towels, sitting area with infrared electric fireplace, cable TV/DVD, small refrigerator, a nice Stearns & Foster mattress and free wireless Internet connection. A full delicious breakfast is served each morning in our elegant dining room by the fire and included with your stay. Perfect for a getaway, relaxation retreat or enjoying the local sightseeing! Relaxing room on the third floor. 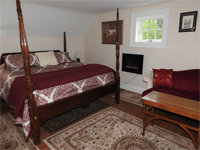 Room includes four poster king beds, cotton linens, sitting area with couch, glass panel wall electric fireplace, cable TV/DVD, small refrigerator and free wireless Internet connection. 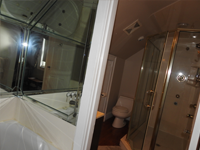 A private bathroom is in a separate room next to bedroom - three step walk in hallway and includes a whirlpool tub with multi-head shower, cotton towels and luxurious bathrobes. A full delicious breakfast is served each morning in our Inn's elegant dining room by the fire and included with your stay. Perfect for enjoying the local sightseeing in Colonial Williamsburg! Connecting deluxe room with private bath and King bed is available as an add on for this room, please inquire.